It took seven months, but I finally made my way back to try out Radhey's tea and dessert selection. As you can see from the photo above, the desserts are varied and attractive with well-labelled vegan, gluten-free, sugar-free and raw options. Even having just snuck out of Yong Green Food with their raw dessert menu, it was the uncooked items that Carol, Michael and I were most drawn to. The raw cacao brownie ($7) was almost cakey with a lovely ganache-like topping. Nevertheless, it was outshone by the raw raspberry swirl cheesecake ($7), a super smooth square of creamy sweetness lifted by the tanginess of real raspberries. My plant milk-based chai ($4) was warm and comforting, but too light on the spice for my taste. 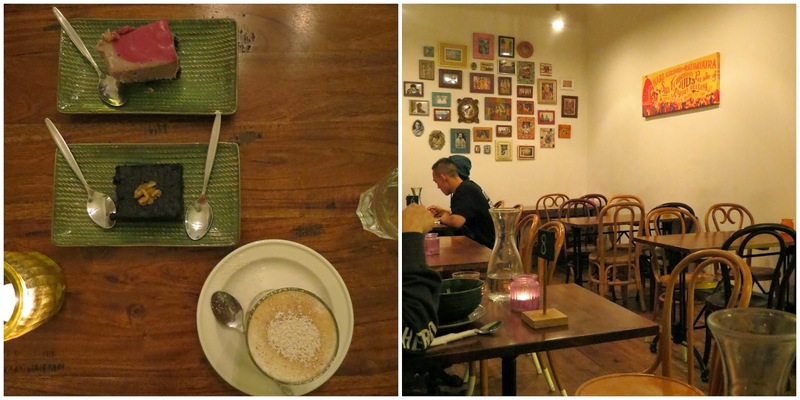 On a Saturday night, when the rest of Brunswick St was poised to get rowdy, Radhey Kitchen and Chai Bar was a welcome quiet nook for dessert with a friend. We'll continue to seek it out for comfort food and calm. You can read about our first visit to Radhey here. Since then it's been blogged on Fire & Tea, Zinc Moon and Veganopoulous. Accessibility: I think there's a half-step up on entry and a flat interior. Tables are quite densely packed with a clear wide corridor through the middle. We ordered and paid and a low-ish counter, where much of the food is on display and chalkboard menus are easy to read. We didn't visit the toilets.